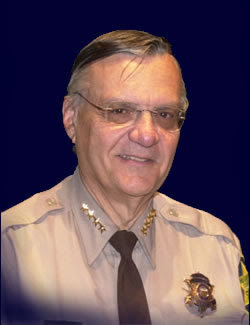 Phoenix, AZ—Never let it be said that Maricopa County Sheriff Joe Arpaio isn’t clever. He has an uncanny ability to solve some problems usually in front of rolling TV news cameras. The problem the good sheriff had was that his deputies were paying parking fees or getting citations on county cars at the Phoenix Sky Harbor Airport. The deputies need to pick up many freshly extradited prisoners there wanted for felony matters to deposit in Sheriff Joe’s jail. The problem was that the City of Phoenix refused to cooperate by ending their parking fee extortion against the county cops. The City of Phoenix just unveiled their new light rail mass transportation system with service to Sky Harbor Airport. City officials are feverishly trying to get the public to use the new system. Sheriff Joe could not wait to oblige and help them with their public relations campaign. I don’t think Sheriff Joe’s publicity idea was what the city politicians were looking for to increase ridership. Sheriff Joe announced he had a way to save $75,000.00 per year in airport parking costs. He pulled off yet another media stunt announcing his deputies would begin using the light rail to transport felons. With TV news cameras in tow the resourceful Sheriff went along as his well armed deputies picked up a hapless wanted felon from Sky Harbor Airport transporting her by light rail to his jail. The thought of Sheriff Joe expanding the program to include jailed chain-gangs being sent to work sites worked incredibly well to get city official’s minds right. They agreed to let deputies park their vehicles at the airport without charge while there on official business. You just have to love Sheriff Joe and the way he gets things done in in Maricopa County. Maybe Mayor Daley should recruit him for Superintendent!